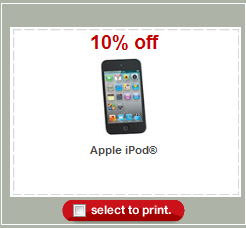 10% Off iPod Target Coupon is Here! Wow! Target.com has a new coupon out for 10% off any iPod! This is the first coupon I have ever seen for anything Apple! Print it here and wait for a gift card promo!